Zakat Foundation of America (ZF) in partnership with another organization was able to deliver two air shipments and one container consisting of mostly medicine to five different hospitals in order to address urgent need for Medical Aid to Gaza. The shipments included items such as antibiotics, chronic disease medicines for high cholesterol and diabetes, vitamins, and nutritional supplements for pregnant women and children along with other urgent care medications. Part of this shipment also included wheelchairs, canes, and crutches. Hundreds of highly needed disposable medical supplies were also delivered, including face masks, sutures, bandages, gauze, and baby diapers. 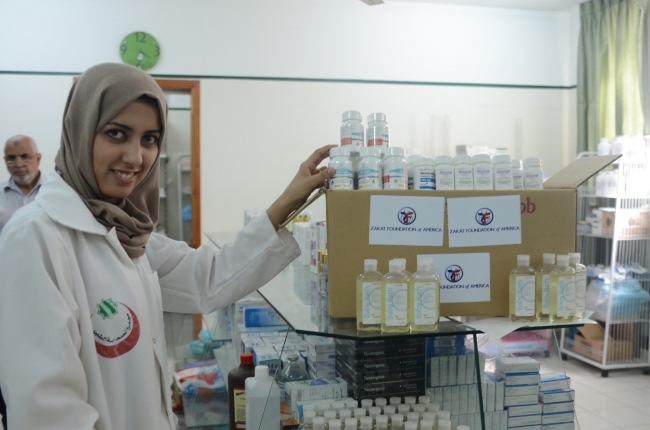 The total value of these three Medical Aid to Gaza shipments was worth more than $2.7 million, and it covered the costs of receiving these medical supplies, importing them through customs, transporting them into Gaza, and delivering them to the selected clinics and hospitals. The main recipients of these shipments included: Public Aid Society, Shifa Hospital, Society for the Physically Handicapped, and Palestine Red Crescent Society’s Al Amal and Al Quds hospitals. ZF is committed to making sure Gaza residents get adequate medical care considering the alarming mortality rate due to war and illnesses that are left untreated.